We have mentioned before that our experience discovering the key ingredient in Nigeria's famed suya spice was none other than a serendipitous event. It only took adding a tablespoon of peanut butter to a stew with spicy biltong to give me that undeniably recognizable whiff of nutty spice; ah the ubiquitous suya smell wafting about our senses. Lo and behold a simple pack of roasted peanuts and the additional spices and seasoning are all it takes to replicate that awesome street food in your own kitchen. Read on to find out just how. We believe there are 3 essential ingredients in suya spice. Peanuts, cayenne pepper and salt. Perhaps a fourth with ginger, however there are variations to making this spice. To make suya spice at home, you will need the following ingredients. The first step in making suya spice is to crush the peanuts to very small pieces. The result should look like a fine crumble. Be careful not to overdo this as we did a couple of years ago when we first attempted to make the spice. We ended up with spicy peanut butter, as the oil content of the peanuts is quite high, meaning you could end up with a wet spice, as opposed to a dry one. The tools you will need for this step are a pestle and mortar. If you are pressed for time, you may use a handheld chopper or food processor, as explained in the next slide. A hand-held chopper or food processor can be used if you are pressed for time. A word of caution needs to be adhered to in this regard. Due to the powerful rotations of blenders, the peanuts could turn into peanut better fairly quickly, therefore care is needed for this step. 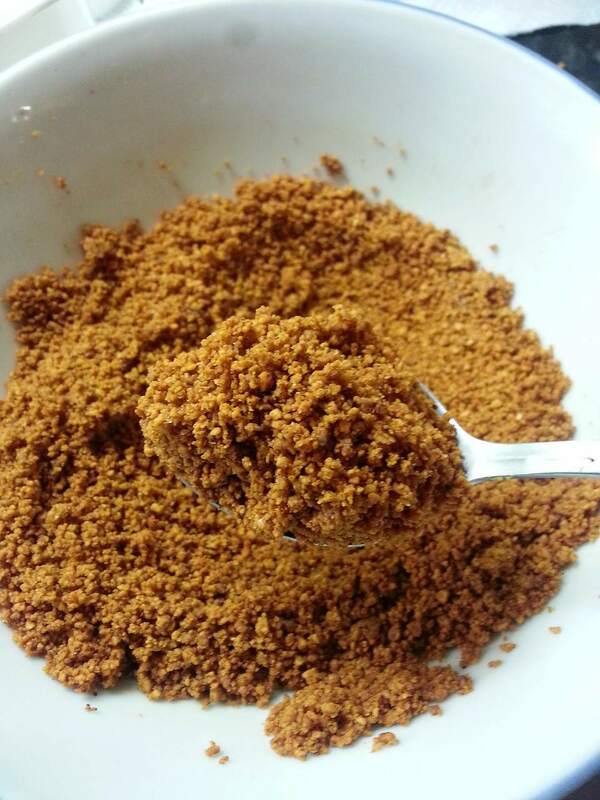 If the ground peanut crumble becomes over processed and sticky, do not dismay, you can still use it to make the spice. It is the taste that matters. This step is especially useful in the event that you do end up with an oily peanut paste as opposed to a crumbly powder. There are some that would completely omit this step, however, based on our previous experience of creating a hot and spicy peanut sludge a couple of years ago, we would follow every step, especially if it was the first attempt. To eliminate the peanut oil, lay a clean paper towel on top of the kitchen counter then spread the peanut crumble over the surface of the paper towel, but just small enough to ensure it will be covered by the base of a large pot. Once the crumble has been spread, place a second paper towel on top of it, followed by a heavy based pot, and any additional weight you can find. Have a look at step 4 so you can see what we mean. Patience should be exercised when extracting the oil from the peanuts. We have always found that making this spice ahead of the occasion or event at which you wish to use it is key. We normally place a heavy-based pot on top of the paper towel covering the peanuts. We make it as heavy as possible by adding a few things to weight it down. we then leave it to do its thing for at least half an hour. Once extracted, you may proceed to mix in the spices. This does not need further explanation. The spice is now ready for use as a rub for meat. If using beef, the best cut is sirloin steak. During preparation, it can either be sprinkled on top of the meat skewers during grilling or once the cooking process has been completed. As we have made quite a big batch, use the quantity required, then store the ​remaining spice for another day in an airtight container.